I have been stitching since I was eight, and am a self confessed thread junkie. I buy amazing threads, get them home and wonder what I shall do with them! I make bags, panels, pictures, and cushions. 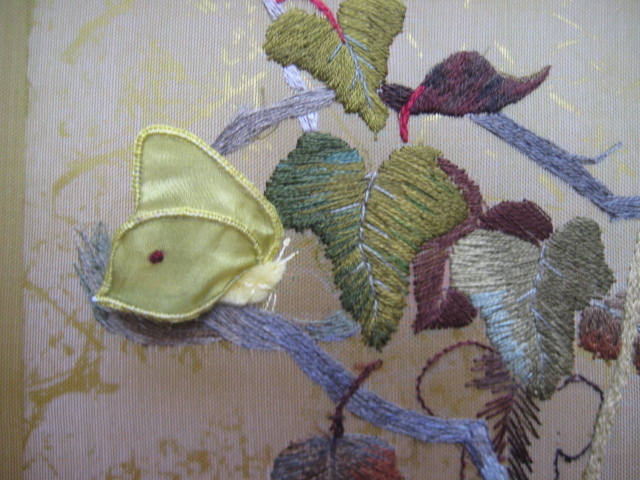 My work includes technically correct embroidered pieces, freestyle work, and I make and embellish felt. I use whatever technique I feel suits the project and I’ve always got at least three or four things going. I also do extreme knitting and make rugs and throws. I taught myself many techniques, then in 2005 achieved my RSN Certificate. 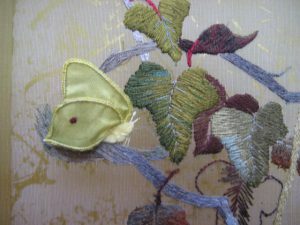 I have worked for an embroidery company, and for Zweigart Fabrics, but now prefer to work freelance as I can ‘play’ more. My inspiration often comes from nature, butterflies and birds especially. I spend a lot of time walking my dogs on Cannock Chase and over the Welsh mountains. Watching the seasons change is amazing. My other love is history and I use a lot of traditional techniques in my work. I also specialise in Iron age textiles, spinning, weaving, embroidery, dyes, and felt. I am a qualified Primary teacher with over 20 years experience of many forms of teaching, not just in a classroom. I also run a company called Timezones. Delivering textile, and history workshops to schools. We use drama and hands on artefacts to teach children how people lived in the past. As long as I can stitch I am happy!